I have been using Ubidots for a while and am very happy with their features and ease of use. The service is also very affordable with up to 30,000 data point uploads (or dots) a month for free. I don’t use that many in a month but I believe in paying for value so I subscribe at the “Starter” level. Pricing information can be found here. Ubidots allows you to push data from almost any device then create a dashboard to display, analyze and share that data. You can also set triggers and alerts that can automate responses to data thresholds you set. Finally, all this is accessed by a powerful, standard and fairly well documented Application Programing Interface (API). Here is an example from a project I am doing to monitor the number of cars entering a local park. As you can see, I can see where the sensor is placed, the current cumulative count for the day, the battery level of the sensor and the number of times the sensor has had to retry sending data (an indication of signal strength / interference). 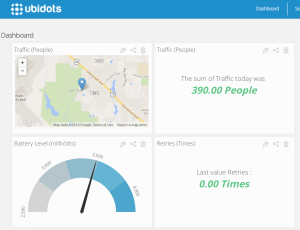 Ubidots makes is VERY EASY to set up a dashboard like this – which is why I like them. As we will be using the Arduino IDE for this LinkIt ONE project, I recommend you sign up for an account and follow this simple tutorial which will step you through the process of sending data to Ubidots. If you look at the example code provided, you will see I had to use the AT commands that are at the core of setting up and using a GPRS connection. Luckily, MediaTek has provided a higher-level library for the LinkIt ONE so our code will look much cleaner. I have provided a simple sketch called Basic Temperature Logger in my GitHub repository. This sketch will connect the LinkIT ONE “Source” to Ubidots and send two “variables” of data – Temperature and Battery. The Battery variable will have a “context” of the GPS location for the LinkIt ONE. This will enable us to create a simple dashboard like the one below. Over the weekend I plan to build the Air Quality Board and – if all goes well – it will be a relatively simply matter to add additional I2C sensor feeds and additional variables to this page. I hope this had helped you see how easy it is to set up a Internet of Things dashboard using a service such as Ubidots. BTW, while Ubidots is my current favorite, there are many others out there worth looking at. I have personally used IOT services from Sparkfun and Xively but if you have others you like, please feel free to make comments.